Early next month the top eight Smite teams in the world will converge on Atlanta to battle it out over a massive $2 million prize pool. How did a first-year MOBA get a pot so big? The same way DOTA 2 did it — crowdfunding. And so the prize pool has exceeded $2 million making Smite the first game in eSports history to feature that big a pot in its first competitive season. First prize in January's tournament is over $1 million, for a game that's only technically been out since March. That's pretty insane. 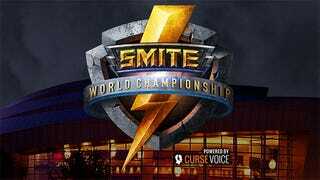 Since the Smite World Championship is taking place in my own backyard on the weekend of January 11 (my mother used to hold dance recitals at the Cobb Performing Arts Center where the tournament is being held), I'll be hanging out making a nuisance of myself all weekend long. Smite is a free-to-play MOBA with a unique third-person perspective, with some 61 combatants representing various real-world mythological pantheons. It's currently available for PC, with the game making its Xbox One gameplay debut during January's event.